How to obtain autographs at San Diego Comic Con. Photo I took of Molly Quinn and her dad. Also the paper I had her sign just after taking this photo. Before I get started here, I have to disclose that I’m purely speculating at this point. The biggest variable (you mention further down) is that the Star Wars panel will very very likely be on the same day as the signings. Usually right before or after the panel. We have no idea how many people from the Star Wars fandom will be in line for the panel vs the line for autographs. But you can pretty much guarantee that you’ll need to be in line early. In my original post, I got in line at 3:45am and by the time I got to the Sails Pavillion, the drawing for Game of Thrones was finished. So, yes, you’ll need to be in line quite early. I’m not sure exactly when, but I would be in line at the latest, midnight. Probably before that. True, they haven’t announced yet. 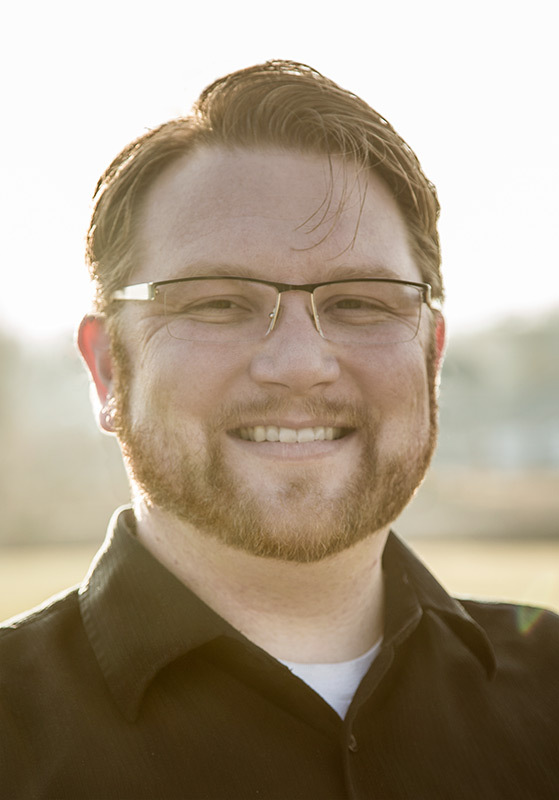 Which is frustrating, but the news will come. I have a hard time imagining they won’t do SOMETHING, but who knows what yet. Maybe it’ll be some minor cast members, maybe it’ll be the whole shebang. Usually you won’t even know at the time of the lottery, you just cross your fingers and hope for the best. I haven’t been at SDCC for a Lucasfilm’s signing, so I don’t know this for certain, but my best guess is that the drawing will happen at the Lucasfilm booth, NOT the Sails Pavilion. That’s how Marvel handled it last year and they’re both owned by Disney. So I’m guessing they’ll take a cue from how Marvel did it and copy. There is perhaps a very slight chance of getting one by hanging around and hoping, but I would get in line. The nice thing here is that right now you’re flying blind, but you won’t be on signing day… at least not completely. You’ll have all of Wednesday and Thursday (if you have those passes) to get to the Lucasfilm booth and ask for an autograph schedule. Then you can plan accordingly. Most of the answers here revolve around signings at the Sails Pavilion. 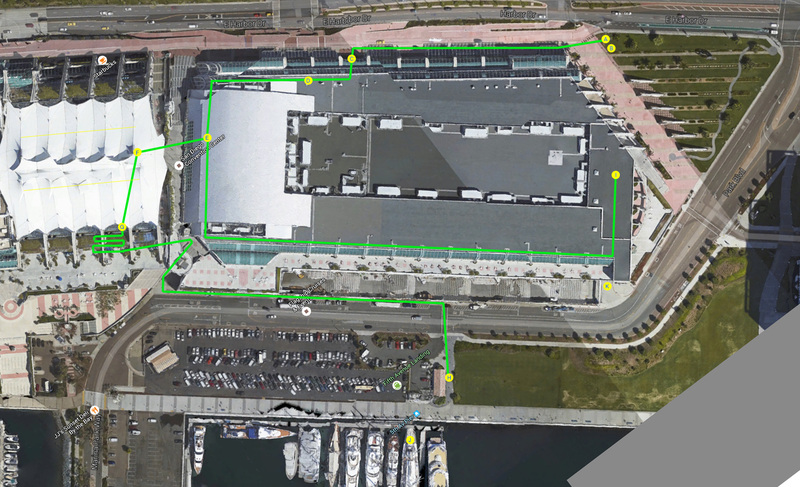 If it ends up being on the Exhibit Hall, you move to that line instead of the Sails line and get to the booth as soon as possible and get in that line. I wouldn’t bank on this, but I have attended the signing lottery at the Sails Pavilion and then gone to the exhibit floor line (the exhibit floor won’t be open when you get done at the Sails Pavilion) and got to the Marvel booth and drew out for the Marvel signing as well. But I considered myself extremely lucky that day I was also very very close to the end of the Marvel line. You can TRY to catch them behind the convention center at the loading dock before they load into the limo, but there is next to zero chance you’ll even get close enough to ask. Security won’t let you near, you’ll likely be all the way across the street. There IS a chance if you wait next to the TV Guide yacht that they MIGHT leave the convention center and be escorted to the Yacht and usually they will sign for 7-8 people there. Timing is likely before or after the panel, but you never know for certain. There is naturally a bunch of rushing around but there are volunteers everywhere and they will highly discourage any actual “running”. But there is a lot of people “walking” without bending their knees at an almost running pace. Once you get up the escalator and you’re either going left to the exhibit hall line or right for the Sails Pavilion, the area opens up very wide and the likelihood of getting trampled is somewhat low as there’s plenty of space. Just don’t stop. As for the Walking Dead, I’ve never done that one… but it seems like it’s at the Sails Pavilion, so you may have to make a choice. Yes (in the Sails Pavilion), you can move to the back of another autograph line, but keep in mind the entire time you were standing in line to draw out, they were lining up… so these opportunities will be limited. But you can certainly try to do that and that is how some people are successful at drawing out for a few different signings. In the chaos, it’s a little hard to tell where to go. If you see someone with a clipboard, ask them where to go if you don’t know already (clipboard people are usually directors and know much more than regular volunteers). Usually lines won’t move, so if it IS in the Sails Pavilion (which I doubt) it will be in the same place as it was on Thursday (if there WAS a Lucasfilm line on Thursday). But normally, everyone else is trying to find out the same information and you won’t lose a ton of time because everyone is also trying to figure out where to go. I can tell you that the moments leading up to reaching your hand into the bag to draw a ticket are some of the most heart-pounding moments of my life. That includes repelling off cliffs with waterfalls and other crazy stuff. I’m there with you, the lottery system is very very scary. I have certainly walked away disappointed more than once, but I’ve also been elated a number of times and happy beyond belief with my luck. This is accurate. Likely you’ll have to choose one or the other. I haven’t ever seen the scenario where I was able to go to the panel AND attend the signing, but you never know for sure I guess. If Lucasfilms is doing stuff for multiple days, you never know. There certainly is hope. I’ve drawn out for popular signings, but I’ve also been denied and devastated. I totally know how you feel and if you go for the autograph thing, I’ll be right there with you. There IS always eBay. The prices will be very expensive for this signing (if there is one), likely $1500 or so, but there will be people selling them. So if you are ok spending the cash, you could technically get both the panel experience and the autographs. If you don’t want to risk it and decide to go to the panel, please remember that this panel is going to be the absolute biggest panel of Comic-Con history. The Ultron panel last year required getting in line by around 6pm the day before. This panel will be earlier I’m certain. I think if you want to guarantee getting into Friday’s Star Wars panel, you’ll have to be in line on Thursday morning. NerdHQ is your best chance at getting either an autograph or a photo with Nathan Fillion. But let’s talk autograph first. You won’t find Nathan Fillion walking around. If he does grace the con floor, it would be in a mask and he hasn’t been caught doing that yet. The ONLY way I’ve seen people get autographs by Nathan at SDCC is at a Conversation for a Cause at NerdHQ. Those are the panels (that haven’t been announced yet). Normally (though this convention isn’t quite normal) Nathan will do two “Conversations” and he’s notorious for bringing a “Bag of Crap” with him. It’s just stuff from his house. Like promotional stuff or other odds and ends, lots of t-shirts. Then to raise funds for Operation Smile, he’ll sign them and auction them off and the proceeds go to Operation Smile. That being said, the auction prices go REALLY HIGH. I lucked out once and got a T-Shirt and one of his diving test tubes for $250. That is one of the lowest prices I’ve seen. Normally by the end we’re talking $1000 for an item. So the price range for one of those signed items is $250-$1000. To make it even more challenging is that the “Conversations for a Cause” tickets from NerdHQ sell out in seconds. So they’re very difficult to get, especially the Nathan Fillion one. Here’s a TIP: Keep trying for up to an hour after they sell out if you didn’t get tickets. If people have tickets in their cart and their cart expires (every 15 minutes), they go back out to the general public. So you still have a chance if you didn’t get one initially. This is a photo from the photobooth at NerdHQ that happened right after the Nathan Fillion panel. There is also a chance to get a photo op with Nathan. Usually right after his panel there will be a photo booth opportunity for $20. If you were in the panel, they let you line up first, but after that they’ll let anyone join the line. It caps quickly, but is a way to get a photo if you missed the autograph chance. There isn’t really a protocol. I would just say be respectful of what they’re doing and the vibe they’re putting off. I once ran into Molly Quinn (from Castle it’s the pic at the top of the article). I recognized her, got a quick photo (without acknowledging that I recognized her) and was able to ask her publicist if it was ok to get an autograph from her after the photo. She said yes as long as we kept walking. 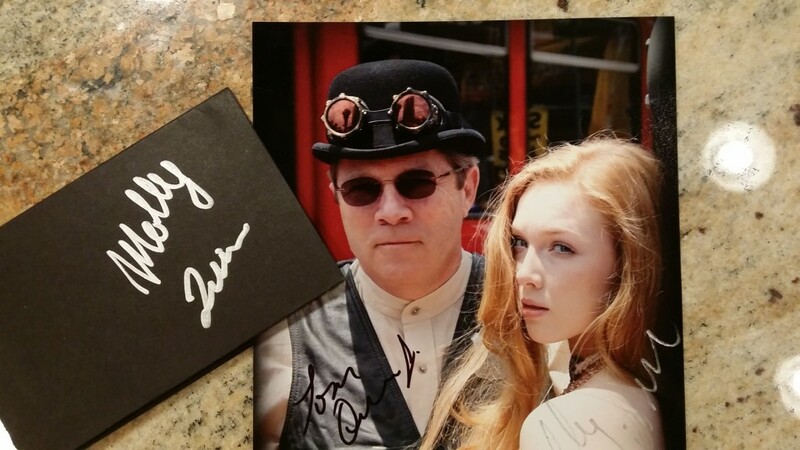 I always keep a small autograph “kit” on hand and easily accessible for these types of things and was able to get Molly Quinn to sign it while we moved through the crowd. That moment has been my absolute favorite convention moment out of ANY so far. I try to find Molly Quinn at least once at every convention now. Usually I get a pic, but I was able to get her to sign a photo I took of her that first time at an event last year. Ok, that’s all the questions that Sue has, but I thought if I threw together a map for the Sails Pavilion lines and such that it could be helpful, so here it is with markers showing the significant points. Also keep in mind that if you draw a ticket, stay where you drew it until you are absolutely confident that you where where and when to line up for the actual signing. They’ll usually tell you right away, but sometimes they’ll be so busy managing the line that you need to ask. 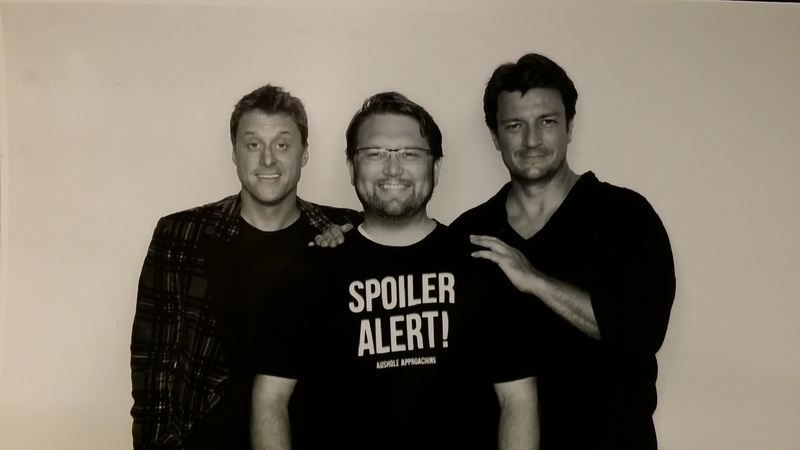 So jealous of the Alan Tudyk/Nathan Fillion Photo! (I already have Alan’s sig on a Knight’s Tale press photo). Great stuff! The lottery is on the day of the autograph session. So if you want an autograph happening on Friday, you have to line up very early on Friday to get it. You will have to have a badge once the line progresses into the building AKA at 6am-ish. Most autographs I’ve gone for are on Friday or Saturday. For those days, you have to pick your early morning line to be in and stick with it. You won’t get into Hall H on Friday or Saturday if you get in the autograph line. If you’re getting autographs on Thursday or Sunday, you would likely be able to get in Hall H after drawing at the lottery. I come with my 10yo son from Australia next year, any thoughts on child friendly signings/panels/photos? All the panels are “supposed” to be child friendly. That being said, the panelists don’t always follow the instructions on the card. You can probably guess which will and won’t be ok for kids based on the show or movie they’re presenting about. I wouldn’t be worried about signings being a problem at all.